As i've mentioned earlier, I love almonds and it is the 'good' nuts where u don have to worry for cholestrol, putting weight etc.. When mahanandi posted this recipe, I knew i had to make but waiting for my health to get improved. the process is all same and I hope u'll njoy as well..
Cardamom --crushed -- 1 no. Add the almonds completely immersed in water and boil it. Once u've a nice boil switch the fire off. Remove from the stove and leave it for 5 minutes. ( otherwise u may soak ur badham in cold water overnite to peel the skin, as i din't have time ,went for this method). Drain the water and peel the skin. Now pat dry the almonds for 10 minutes else u may wipe the almonds with kitchen tissue and save the time. Ad the almonds in food processor / mixie and finely grind it. Ensure that u don't have anything chunk nuts left behind. Place the almond meal on a plate and keep aside. U'll get 3 cups of almond meal if u measure it now. Next step is to get the correct consistency of the syrup. Add the 3 cup of sugar and just enuf water to completely immerse the sugar. Boil the sugar until it is dissolved completely and then turn the flame to medium . Now keep an eye on the syrup as we requires soft ball consistency and u can expect this stage anytime after u get the one string consitency. Drop the sugar syrup in a bowl of water and if it isn't dissolved and it is flexible n if its retain its shape ,then u got the soft ball consistency. Grease ur mould with clarified butter /ghee everywhere and make it ready. Now add the meal when u get the soft ball consistency and combine well so that u don't have any lumps settled on one side. Keep on stirring until the mixture starts leaving the sides. For me , it took not more than 5 minutes.. U may add ghee ,say a tbsp,while stirring. Finally add the crushed cardamom and combine well. Pour the mixture in ur mould and pat it evenly and square them. Leave the settings for half an hour and then ur burfi's r ready to Njoy !!! Actual recipe called for 1 : 1 (almonds to sugar ). But I've added bit extra to suit our family..
Sending this to Aipi and Priya's "Bookmarked recipes"
Love the heart shaped pan:) and the burfi looks really delicious! What delicious little treats! I bet they just melt in your mouth..a keeper recipe! Shanavi, I am sharing the first award i received with you too. Please accept this as a token of appreciation for all your efforts and for inspiring me. Thank you so much dear for visting my blog n following n for ur valuable comments..
Love Almonds...i like ur version of almond burfi! 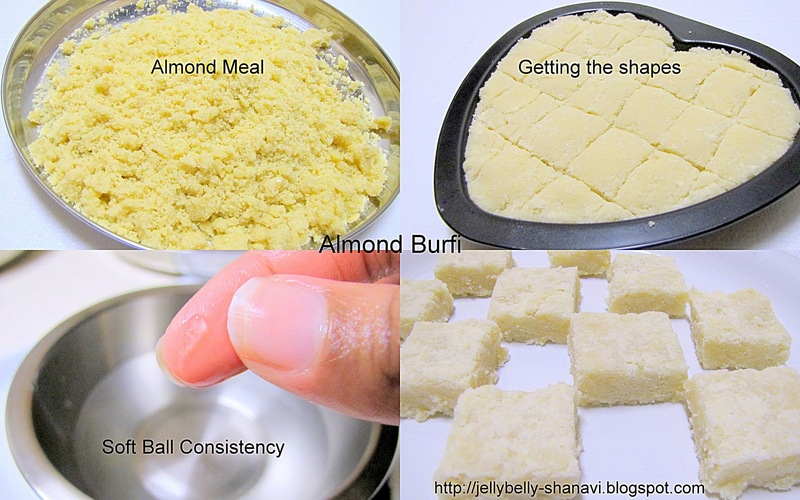 !Delicious and yummy burfi!! Perfectly done,tasty and tempting burfi. Shanavi, it tasted heavenly & very soft..
Burfis look excellent. Would definitely try out your method. Glad to be following you. if i were your next neighbor, without a doubt i would have wanted a sample!!! Beautiful entry..